Dahlings, little did I know that I would be following on to my prior article so soon: the one about a demon attacking an aircraft engine mid flight and the traveler going out of his mind. Cleo is in Philippines and traveling with a colleague from Manila to our final destination of Baguio city. A car driver was there to pick us up from our Makati hotel and Manila traffic was relatively light. 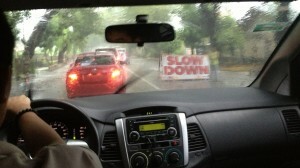 Once out of Manila, the journey took us up the North Luzon highway and the driver followed the speed limits. All seemed to be good. All very pleasant and relaxing. That is until the North Luzon highway ended and old world Philippine roads began. Since it is the rainy season with the weather forecast was for rain for next 7 days, it also started to rain. However, the rain was really Rain not rain. The change in roads and weather was the cue for our driver to change gear from cruise to maniac. Overtaking, undertaking. Straight roads, blind bends. School zones, countryside, towns. Motorbikes, Jeepnies, pedestrians, dogs, cattle all had to obey the tooting command from our car horn to get out of the way. Even Cleo’s Collegue who comes from an old world country, was mortified with what we were seeing. Visibility was terrible and many oncoming drivers didn’t have their lights. Even when the car’s back end skidded going around bends and we climbed into the hills, the driver did not relent is his mission. Good news is we got to our destination safe albeit very early. I now understand why the Philippines is such a religious country: Any moment now, you may be meeting your maker. Dahlings, Tomorrow I must endure a long haul flight. Being the minx that I am, I have previously joked about the “Twightlight Zone” movie and the gremlin on the wing tearing up the engine, but only one passenger can see it. The passenger who eventually goes crazy, was played by a much younger John Lithgow. Nobody in my entourage remembered it so I was looking it up for them. Well, Roll me over in the clover. Youtube didn’t have full version of what I was looking for but I found instead something I haven’t seen. The 1963 original. Guess which Thespian played the passenger: it is Cleo’s longtime friend, William Shatner. I am sure Priceline would be delighted in using this footage. They should put it under tips for nervous passengers : Tip #1: get an isle seat. I eventually did find my other dear friend Johnny “JoLi” Lithgow’s version under Vimeo. Dahlings, here it is for completeness. Dahlings, So the Prince Of Wales flew coach on his way from Memphis to Dallas. It is a mistake any blue blooded person could make. The poor boy: a simple misunderstanding between American English and British English. British: COACH: A means of luxurious transport attached to horses with a driver called a coachman. Often used for short distances between your Palace and the Abbey. American : COACH: A Compartment where the Colonials rustle animals in as small a place so they cannot rest comfortably, fed as little as possible and abused by their captors.